This Easy Banana Bread Recipe is the absolute BEST! Moist, loaded with bananas, sweetened with brown sugar, and baked in a cake pan for even and quick cooking. No mixer needed, grab a bowl and whisk – ready in under 30 minutes. If you asked me what I bake most often, the answer would undoubtedly be banana bread. And if you went poking around this website looking for my favorite banana bread recipe you would not have found it. Because, until today, I had not yet shared a banana bread recipe. Gasp! For years, I have been on a search for the PERFECT Banana Bread. I wanted a recipe that is simple, with no fancy ingredients, and no trendy technique. Just a flat-out delicious Banana Bread that bakes up perfectly every single time. Drumroll please… Here it is. Finally. The only Banana Bread recipe that I will make from here on out, and seriously – the best Banana Bread I have ever eaten. Here’s what makes this recipe the best – and what sets it apart from others. Bananas – This banana bread is absolutely loaded with bananas. 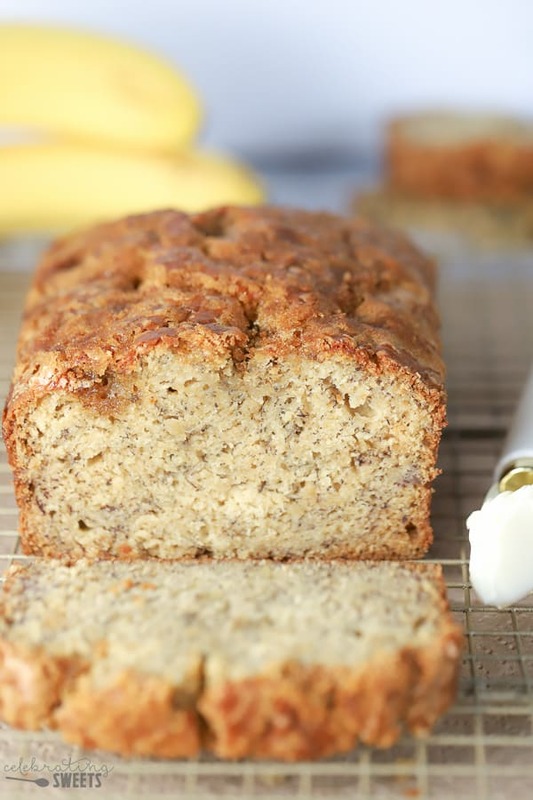 I use 3-4 overripe bananas to make this bread sweet, moist, and undeniably banana-flavored. Brown Sugar – The only sugar used in this bread is brown sugar. 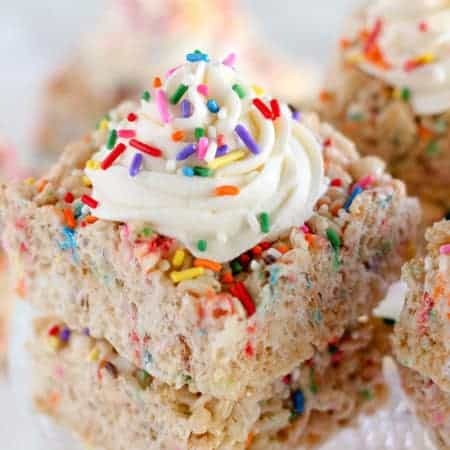 It is in the batter and it gets sprinkled on top before baking. The brown sugar gives the bread a deeper flavor and almost caramel-like sweetness. 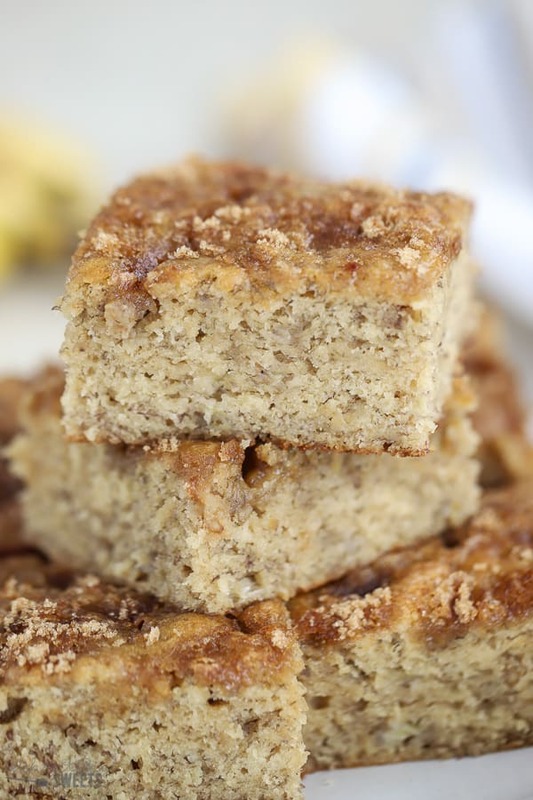 Bonus: the brown sugar topping creates sweet little pockets all over the top of the bread. Vanilla Extract – Banana and vanilla is a match made in heaven! Two teaspoons of vanilla extract lend an underlying vanilla flavor that pairs perfectly with the banana. 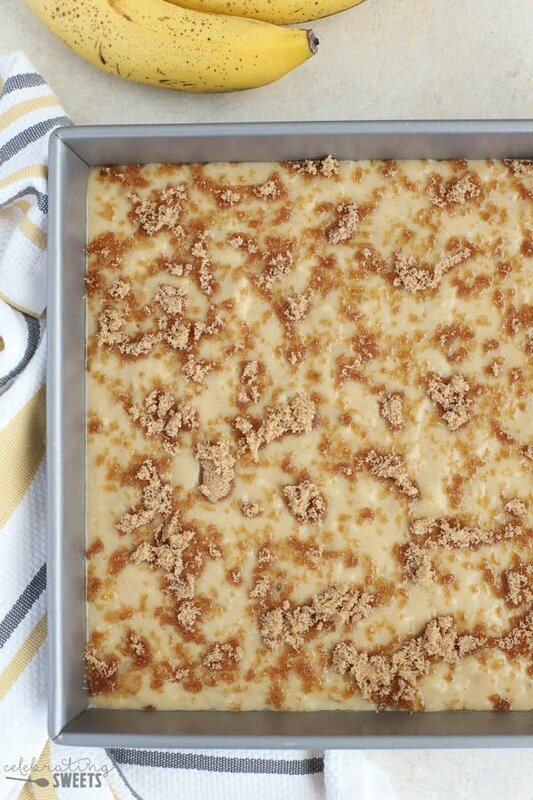 Square Cake Pan – This here is the game changer. I bake the banana bread in a 9×9 square cake pan instead of a loaf pan. This allows the bread to bake in as little as 20 minutes (as opposed to 1 hour in a loaf pan). Plus, no worrying about overcooking the edges and undercooking the center. Since it is not a loaf, it bakes evenly every time. Note: If you’d prefer using a different size pan there are instructions below. Mix-ins – You can keep this banana bread plain and simple, or you can add your favorite spices or mix-ins. Walnuts, chocolate chips or ground cinnamon would all be great! This recipe requires NO mixer. Whisk the wet ingredients in a large bowl. Add the flour, baking soda, and salt and stir until combined. 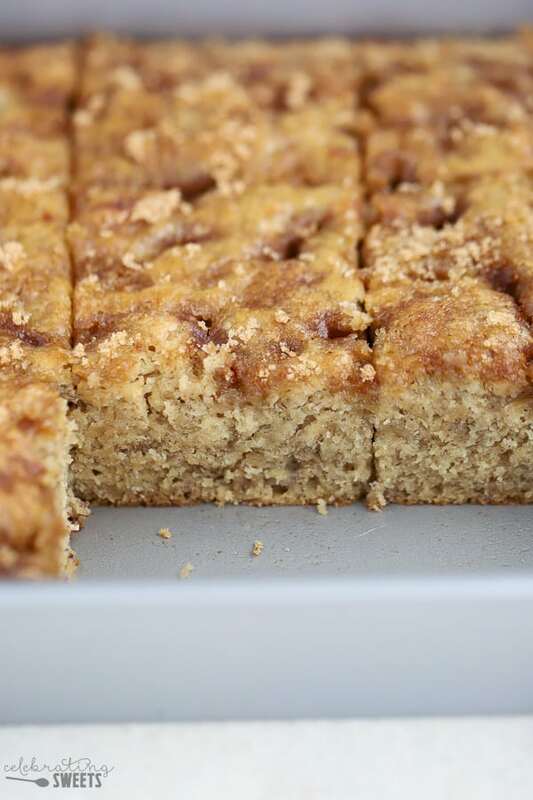 Pour the batter into a greased 9×9 square pan and sprinkle the top with brown sugar. Bake until golden, fragrant and cooked through. 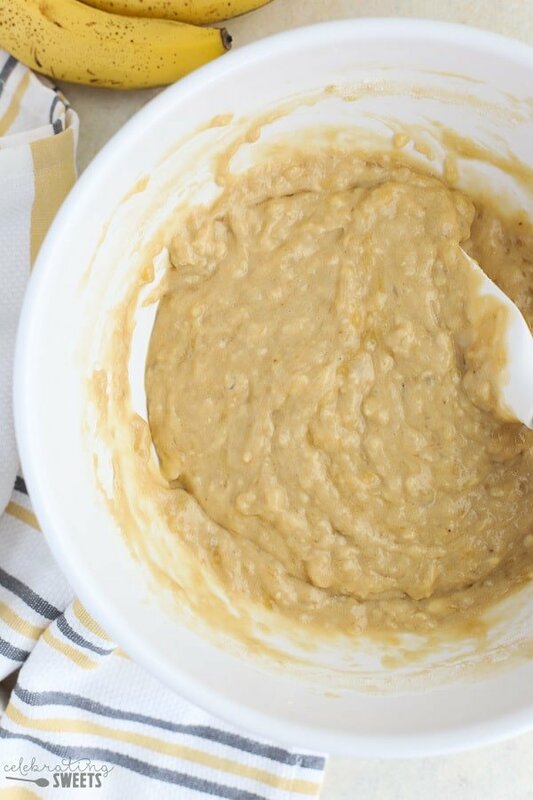 Wondering if you can make this Banana Bread into muffins? Absolutely! The batter makes about 12 standard-sized muffins. I bake the muffins for about 15 minutes, until a toothpick inserted into the center comes out clean. 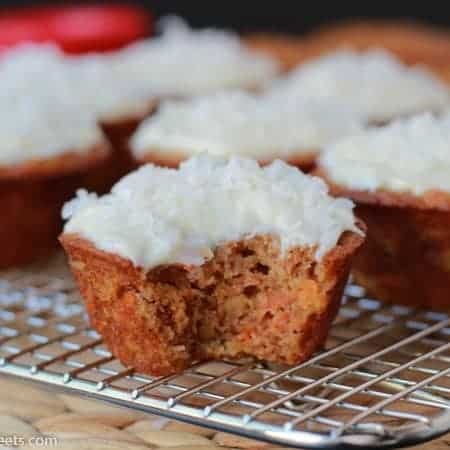 These Banana Bread Muffins make a great lunchbox treat or on-the-go breakfast. Making muffins is also a great way to make a variety of banana bread – sprinkle walnuts in some, chocolate chips in others, and even add raisins to a few of them. Just don’t forget the brown sugar topping! Reduce the brown sugar to 1/2 cup (in the batter). I still recommend sprinkling brown sugar on top. 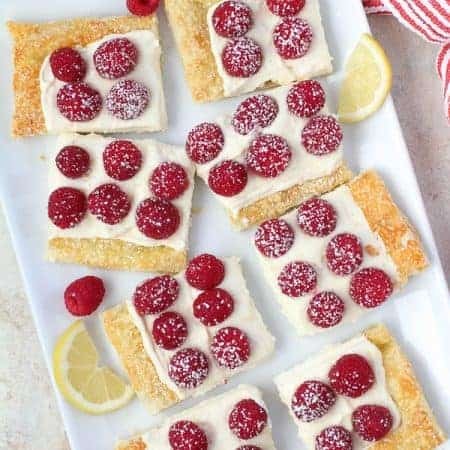 Swap the melted butter for melted coconut oil. Olive oil might work, too (I haven’t tried that yet, though). Reduce the melted butter to 6 tablespoons. Swap 3/4 cup of all purpose flour for whole wheat flour. Add a generous handful of chopped walnuts to the batter for a boost of omega-3’s. This recipe will have you purposely overbuying bananas because you are going to want to have access to this bread every single day of your life. My current simple pleasure: a slice of Banana Bread slathered in honey butter and a piping hot cup of tea. It’s the little things, right? Muffins: Divide batter between 12 greased muffin cups, adjust bake time to about 15 minutes (or until a toothpick inserted into the center comes out clean). 8×8 square: Adjust bake time to 35-45 minutes (or until a toothpick inserted into the center comes out clean). Loaf pan (9×5): Adjust bake time to 45-55 minutes (or until a toothpick inserted into the center comes out clean). This Easy Banana Bread Recipe is the absolute best! 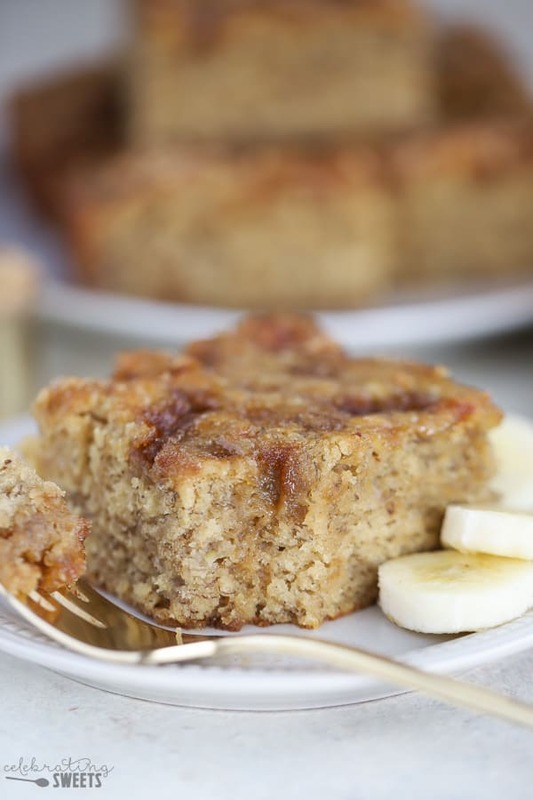 Super moist, loaded with bananas, sweetened with brown sugar, and baked in a cake pan for even and quick cooking. In a large bowl, whisk melted butter and 2/3 cup brown sugar until well combined, about 1 minute. Add eggs, mashed banana and vanilla, whisking until combined. In a separate bowl, combine the flour, baking soda and salt. Add dry ingredients to the wet ingredients, using a rubber spatula, lightly stir the batter until no streaks of flour remain. Be careful not to over mix. Grease a 9x9 square baking pan and add the batter to the pan. Smooth into an even layer. Sprinkle the top of the batter with 1/4 cup (or more) brown sugar. Bake for 20-25 minutes, rotating once during the bake time. The bread is done when a toothpick inserted into the center comes out clean. Place on a wire rack to cool. FLOUR: If you'd like to add some whole wheat flour, I have successfully used 1 cup all purpose flour along with 3/4 cup whole wheat flour. 8x8 square: Adjust bake time to 35-45 minutes (or until a toothpick inserted into the center comes out clean). Loaf pan (9x5): Adjust bake time to 45-55 minutes (or until a toothpick inserted into the center comes out clean). 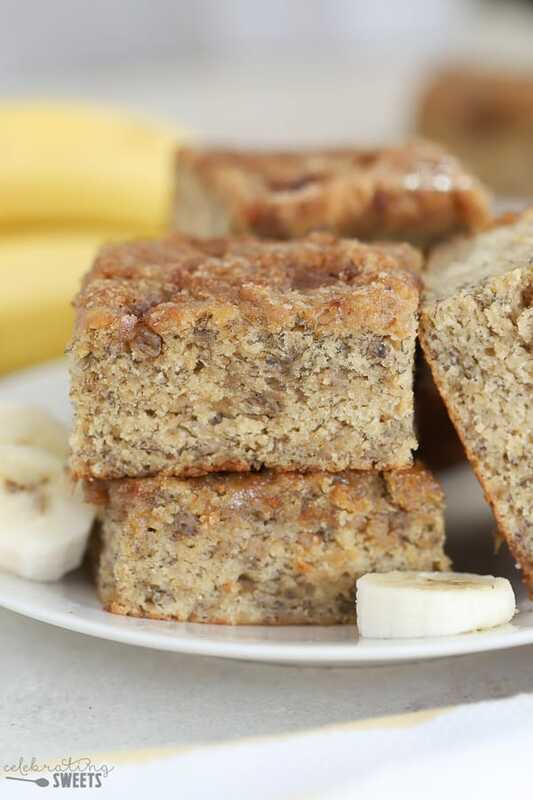 Every week we have a few bananas that are calling to be used in this easy banana bread recipe! this bread sounds so good and a nice break from all of the pumpkin bread that’s been around these days! I think that’s my number one baking too. I’m not a big baker but my hubby loves banana bread. Yours looks amazing, thanks for this recipe! I love banana bread and yours looks amazing! I have to wait a few more days for my bananas to really ripen before I can try this. Can’t wait! 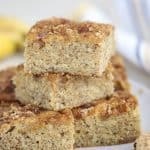 I’ve never made banana bread in a sheet cake style – I’ll have to give it a try! I’ve never thought to make banana bread in anything but a loaf pan, but this is genius. Perfect for making bar size pieces! I love how easy this banana bread sounds, will make it soon! Delicious Banana Bread! I added Mini chocolate chips and peanut butter chips. Yum. Made this tonight. I added mini chocolate chips and peanut butter chips. Yum. It just so happens that I have overripe bananas sitting on my counter right now. Perfect timing for this amazing bread!